"Try the clams. They're fabulous." Avenging Angelo was made on a low budget and ultimately went straight to video. One has to figure that the sudden upsurge in youngish romantic comedies starring combinations of Kate Hudson, Julia Stiles, Matthew McConaughey, Renee Zellwegger, Ewan McGregor, et al crowded it out of the market. Sylvester Stallone is not the box office draw he once was and Madeleine Stowe has never been a marquee name. Perhaps, there needs to be a more specific genre called "Adult Romantic Comedy" to which this film might belong. The Angelo of the title is Mafia Don Angelo Allieghieri, played by Anthony Quinn. Troubles between mob families required him to hide his only daughter, Jennifer, with a WASP-ish family to avoid mistaken revenge by a rival family. Frankie Delano (Sylvester Stallone) has been the daughter's secret bodyguard for her entire life. When Angelo is killed, Frankie is required to reveal to Jennifer her true heritage and protect her from potential reprisals. As the danger grows, she finds that Frankie has loved her for a long time. The screenplay for Avenging Angelo has some serious flaws, including some dubious premises and rather outlandish plot coincidences. However, the story does maintain a certain brittle momentum as it comes just so close to being a very good film. A solid and gentle performance by Stallone does much to tie together many parts that don't fit together comfortably. Madeleine Stowe portrays the adult Jennifer and is a beautiful screen presence, but has limited acting ability. This has probably been the main reason that her career success has been limited as well. Her transition from feckless trophy wife to Mafia princess is mostly nonexistent beyond throwing on a trampy dress and learning a new walk. Did I mention that she is beautiful? The chemistry between Stallone and Stowe is uneven at best. He does a good job of giving her plenty of room to play her character, but unfortunately Stowe is just not up to the comedic requirements to make the magic necessary for this to be a truly successful film. As the plot develops, we meet other Mafia characters and a mysterious figure in the story, Marcello (Raoul Bova), the author of the romantic novels that are the basis of fantasies that Jennifer enjoys as a tonic against the humdrum suburban lifestyle she has been trapped in. Bova is a handsome fellow and has made himself quite a career in Italy as a film star, but his role here does not require much and he provides little beyond a well-coiffed pretty face. Anthony Quinn makes his final screen appearance in Avenging Angelo. It is a potent bit of film in which one feels the mortality of the actor underscore the death of the aging mobster. It is nice to have a chance to pay tribute to an actor who has been a larger-than-life figure for more than 60 years. Starting out his career as a bit player of various ethnicities, Quinn was able to fight to a position of one of the most respected leading men in Hollywood. In 1952, he won the Best Supporting Actor Oscar® for Viva Zapata! and then four years later took another supporting statuette for Lust for Life. Additionally, Quinn received two Best Actor nominations for Wild is the Wind and Zorba the Greek. It is his indelible performance as the wild Zorba for which Quinn is probably best known. But, his filmography is also filled with memorable performances in such films as La Strada, Requiem for a Heavyweight, The Hunchback of Notre Dame, Barabbas, The Guns of Navarone and Lawrence of Arabia. It is almost worth viewing Avenging Angelo just to see that face with the twinkling eyes and hear that voice with its gentle humor, one last time. There are many parts of this movie that are really very good. It's rated "R," but there is not much material that couldn't be found on prime time television these days. There is lovely score by music legend Bill Conti, one of the best aspects of the production. Some of the set pieces, such as the discovery of Jennifer's cheating husband, the funeral of Angelo, Frankie and Jennifer's date at the opera, and the trip back to Sicily, are all very nicely realized comic bits. If nothing else, this film demonstrates what a thin line lies between a successful film and one that just somehow doesn't quite work. Image Transfer Review: Two presentations are offered, widescreen and full-frame, with the widescreen version obviously far superior. Colors are rich and details are nicely captured. The shots of Sicily made me want to go back there and visit. Audio Transfer Review: English Dolby Digital 5.1, Spanish and French Dolby Surround are provided as a nod to the more international appeal of this film and it is a solid job that perfectly accents one of the best parts of the film: Bill Conti's score. Oddly, no subtitles are included. Extras Review: Considering that this film was not released to theaters in the U.S., Columbia has provided a nice set of extras for the DVD. In addition to what would have been the domestic trailer (if the film had been released) and the international trailer, there is a feature-length director's commentary and two featurettes about the making of the film. Director's Commentary by Martyn Burke: An articulate shot-by-shot description from the directing perspective, full of rationales, anecdotes, and other interesting trivia about making the film. Interview with screenplay writers Will Aldiss and Steve Mackall (9m:43s): A little bit different, talking to the authors of the screenplay. They don't really add much to our knowledge or understanding of the film, which is probably why the writers are usually not interviewed. But, their pleasure in the film is infectious. "Making of " featurette (21m:44s): Describes location shoot in Sicily, which is a small but significant aspect of the film. There is some excellent technical behind-the-scenes footage and short interviews are conducted with Sylvester Stallone, director Martin Burke, Madeleine Stowe and Anthony Quinn. Also includes a very poignant description of the last acting job for Anthony Quinn, who died just prior to the film's completion. 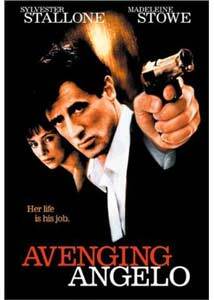 As a fairly lightweight romantic comedy starring Sylvester Stallone and Madeleine Stowe, Avenging Angelo on DVD is quite watchable. Despite its flaws, there is much to be found here as charming diversions, including Anthony Quinn's final film appearance.